X-ray of healthy hip joints. Large breed dogs, particularly German Shepherds, are susceptible to Canine Hip Dysplasia. Hip Dysplasia is a common degenerative joint disease caused by an an abnormal formation of the hip joint. If either parent has hip dysplasia or carries the genes for it, than it is likely to be passed on to their offspring. Another great reason to avoid puppy farms and only visit reputable breeders. Severely dysplastic dogs will attempt to support more weight on their front legs by rocking forward. This can create issues in the elbows and shoulder. They may appear to be tip-toeing and walking lightly on their hind legs. 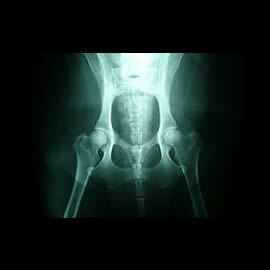 The only way to know for sure if your dog has hip dysplasia is to have it x-rayed. This is typically done under anaesthetic. While sedated, the dog is completely relaxed and it allows the vet to manipulate the hips to feel any degree of looseness. There are surgical procedures available including a total hip replacement. They can be expensive, but some have shown good results. If your dog is diagnosed with hip dysplasia there are many good supplements available that may help.